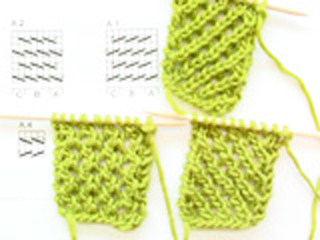 Three variants of the same simple lace pattern. Go to original pattern for design DROPS 81-11. On account of the pattern the garment is very stretchy. The pullover will be approx. 5 cm [2"] wider (10 cm [4"] larger around) than shown on the diagram when worn. 400-450-500-550-600 gr nr 03, light blue. DROPS 10 mm [US 15] needles, or size needed to obtain correct gauge. 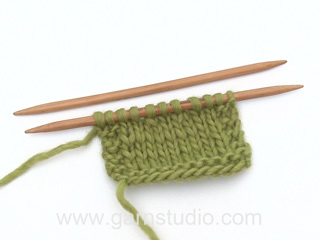 Gauge: 8 sts x 13 rows in pattern = 10 x 10 cm. 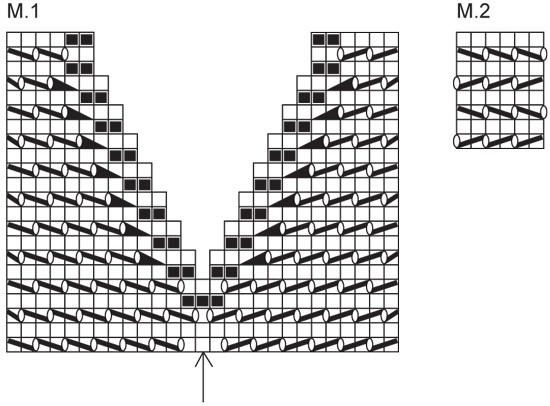 Row 1 (right side): * K 2 tog, yo *, repeat from * - * until 1 st before center st, K 3, * yo, slip 1 st as if to knit, K1, psso *, repeat from * - * to end of row. Row 2 (wrong side): K 1, P to last st, K 1. Row 3: K 1, * K 2 tog, yo *, repeat from * - * until the center st, K 1, * yo, slip 1 st as if to knit, K 1, psso *, repeat from * - * until last st, K 1. Row 4: K 1, P to last st, K 1. V-neck: See chart for Pattern 1. Shape the V-neck according to the chart for Pattern 1 – the sts outside each side of chart are knit the same as before. Note: Shaping begins on the 6th row of the chart, with the center st bound off. The pattern is seen from the right side. All decs are made on right side rows. 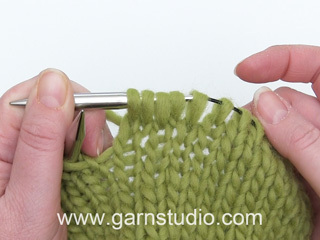 Knit each side separately. On the second side, start by picking up 1 st in the bound-off center st and K tog with the 1st st on second side. This is to reinforce the bottom of the V-neck. Pattern-sleeve: See chart for Pattern 2. = yo, slip 1 as if to K, K 1, psso. = Slip 1 st as if to knit, K 1, psso. Front: Cast on 31-35-39-43-47 sts and K 1 row (wrong side row). Put a marker in the center st. Then knit Pattern-body – see instructions above. When the piece measures 35-36-37-38-39 cm dec 1 st at each side and on the next row cast on 1 new st at each side – this marks the beginning of the armhole. When the piece measures approx. 36-38-40-42-44 cm – adjust to end after a row 4 of the pattern – shape V-neck according to Pattern 1 – see instructions above. After Pattern 1 is complete 8-10-12-14-16 sts remain on each shoulder, bind off. The piece measures approx. 54-56-58-60-62 cm. 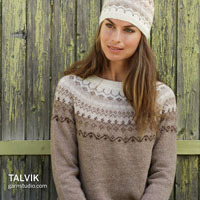 Back: Cast on and knit the same as the front (without neck shaping) until the piece measures 52-54-56-58-60 cm – adjust to end after a row 1 of the pattern. On the next row (wrong side row) K the center 19 sts (P the remaining sts and K the edge sts as before). Then bind off the center 15 sts for the neck (bind off a little tight so the neckline will not stretch out). On the next row bind off the remaining 8-10-12-14-16 sts on each shoulder. The piece measures approx. 54-56-58-60-62 cm. Sleeve: Pick up 30-32-34-36-38 sts in outermost sts along armhole (from the dec/inc on front to the dec/inc on back). Knit Pattern 2 keeping 1 edge st at each side in garter st (1st row of the pattern = the wrong side). When the piece measures 2 cm dec 1 st at each side every 7-6.5-5.5-5-4 cm a total of 6-6-7-7-8 times = 18-20-20-22-22 sts. So that the pattern matches up after the decs, knit the sts at each side that don’t fit the pattern in stockinette st. When sleeve measures 53-51-49-47-45 cm knit 1 row (wrong side row) then bind off. Note: The sleeves will be shorter in the larger sizes since the body will be wider. Assembly: Sew sleeve and side seams in one. Czy jest szansa, że ten wzór pojawi się w języku polskim? Witaj Barbaro, tłumaczenie pojawi się na stronie przed końcem tygodnia. Pozdrawiam! Me gustarìa entender bien como se empieza y como se hace la parte de enfrente, gracias por la ayuda que me puedan dar... besos! Hola Maria Elena, el jersey se comienza por el delantero, montando el nº de pts necesarios para tu talla: 31(talla S)-35 (M)-39(L)-43(XL)-47(XXL). Trabajar ahora una fila de derecho sobre esos pts (esta fila sería el Lado Revés) y después se comienza a trabajar siguiendo el patrón del cuerpo que viene explicado más arriba. Dear Diane, sleeves are worked following diagram M.2 - work 1st row in M.2 from WS (= P all sts) and on next row from RS work the eyelet as shown in diagram. See also this video when working A.4 there. Happy knitting! Hallo! I'd like to knit this pattern with Bomull-lin.Since this yarn is less elastic, which width would you recommend for medium size? Thank you! 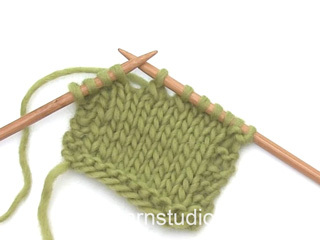 Dear Mary, this pattern is worked in Ice which belongs to group E - click here to find alternatives, and remember your DROPS store will give you all tips & advices to help you choosing yarn if required. Happy knitting! Die Maschenprobe finden Sie oben nebem dem Foto. Sie müssen immer die Nadelstärke verwenden, die Sie benötigen, um die Maschenprobe zu erreichen. Die Garnqualität Ice ist nicht mehr erhältlich, sie hatte eine LL von 45g/50m und gehörte zur Garngruppe E. Sie können als Alternativgarne also die Garne der Gruppe E verwenden, müssen aber beachten, dass Sie die Garnmenge entsprechend der LL des Alternativgarns neu ausrechnen müssen. Bonjour, j'essaie de tricoter ce modèle mais le fait de tricoter 3 m end au centre au rg1 et 1 m end au centre au rg3 il me semble que ça ne fait pas comme le modèle, dites-moi est-ce bien exacte, j'ai l'impression qu' il y a un erreur . Merci j'adore votre site c'est un plaisir! Bonjour Madame Lariviere, et merci. Le diagramme est correct ainsi, toutefois, il faut parfois attendre quelques rangs avant de pouvoir avoir le rendu de la photo. N'hésitez pas à vous inscrire sur le forum Drops pour toute aide complémentaire. Bon tricot ! Bonjour, ces derniers temps j' ai effectuer de nombreux modèles de votre site, tous sans problèmes mais l'explication de celui- ci est fausse dès le début et impossible à réaliser. Bonjour Madame Devaud, effectivement il y avait une erreur au 3ème rang : on doit tricoter : 1 m end, *2 m ens à l'end, 1 jeté* jusqu'à la m centrale, puis 1 m end, et *1 surjet simple, 1 jeté* jusqu'à la dernière m. Bon tricot ! In the pattern-body Row 1... after knit 3 at centre...it continues *yo, slip 1 st as if to knit, (then here is missing the instruction to knit 1), then psso* can you confirm this?